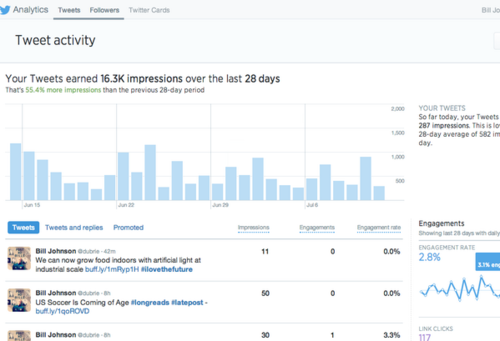 Recently Twitter released an analytics dashboard for Twitter Cards. It’s a well designed and interesting tool showing you a lot of useful information about each of your tweets. For each tweet you can see how many times it was viewed, how many times people engaged with it (like clicking your username or hashtags, retweeting it, or even viewing the tweet detail page), and the overall engagement rate. I’m impressed that Twitter is freely and openly exposing this to all of its customers and not just those that pay for promoted tweets. The dashboard only calls out the last 28 days (and implies the previous 28 days by comparison) so it’s not shocking they only provide a subset. Another quick command shows that 871 tweets covers the date range of 10/1/2013 until 7/11/2014 (yesterday). Oh well, that should be plenty to play around with for now. And there is my first mistake in this process: I only have 835 tweets instead of 871. Quick verification shows that between the header row in the dataset and tweets with newline characters in them, I over-counted by 35 tweets so that checks out. Of note is that it appears that things you have retweeted do not appear in your analytics data so you will not be able to measure any ripple effects. What about my “best” tests? Or in other words, most engaging and viewed tweets? Not shockingly, tweets during my Sounders Dream Camp experience were the most engaging and most viewed. Also, holy crap that was a really fun week! You can see in the chart above that there is a large difference between days but in general the end of the work week is the best time for me to tweet and have others read and engage with it. Having these “day” and “time” slices allows me to answer my three stated goals from above. However, I couldn’t help myself from taking the next step and figuring out what is the most optimal hour of the week I should send a tweet to maximize my impressions and engagements. The size of the marking provides the scale or significance of value. A blank spot is least significant, followed by a “.”, then a lower case “o”, and then finally a capital “O” being most significant. This shows pretty clearly that a tweet at 1pm on Friday is my most optimal time for impression and 8am on Friday is a close second. For engagements, Thursday at 1pm and Friday at 1pm were far and away the most significant with no other times coming close. You can also see the general trend of activity towards the end of the week where Sunday-Tuesday morning are very light and Wednesday-Saturday are fairly heavy usage. I’m slightly surprised to see an east coast bias in the activity times (6am-2pm) as most of my Twitter usage has been since I’ve lived on the West coast. I’m curious to run this again as I tweet more and more to see if and what changes over time. For now though, you will probably be seeing more tweets from me at 1pm on Friday! 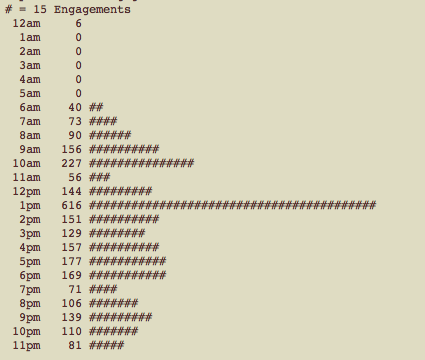 If you don’t already, you should follow Twitter Data for more cool insights into Twitter data and usage. And there is my first mistake in this process: I only have 835 tweets instead of 871. 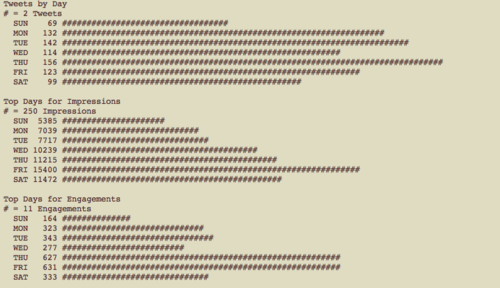 Quick verification shows that between the header row in the dataset and tweets with newline characters in them, I over-counted by 35 tweets so that checks out. Of note is that it appears things you have retweeted do not appear in your analytics data so you will not be able to measure any ripple effects. What about my “best” tweets? Or in other words, most engaging and viewed tweets? Do you hold off on booking calls or meeting spots because you don’t feel like typing out a dial-in or an address? Keyboard shortcuts are your solution. 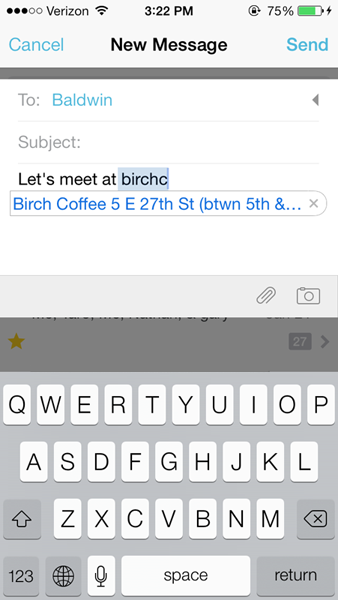 Keyboard shortcuts are normally used for abbreviations like “omw” for “on my way!”, but they work just as well for dial-ins and locations. I made a few shortcuts for spots that I frequently meet at and my go-to dial-in number for when I’m booking things while I’m mobile. 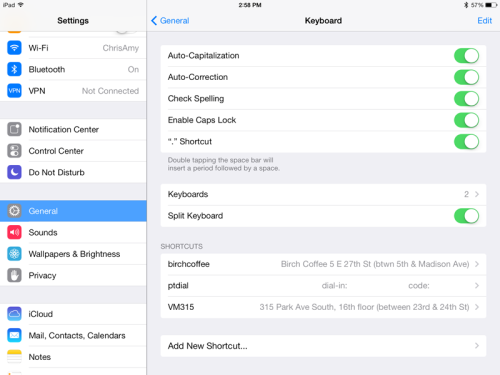 A bonus: your keyboard shortcuts sync across devices thanks to iCloud. My @Target Mobile feature list. 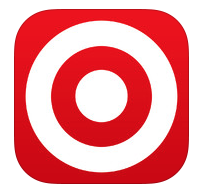 What features do you want Target to add? I shop at Target stores a minimum of four days per week. That’s life. That’s just how it is for a family of five; I’m not sure if we are the norm or the exception, but social activity from friends seems to indicate the former. I enjoy using Google Reader, Del.icio.us, and Tumblr quite a bit throughout the course of a day. I also enjoy sending interesting articles and funny links to friends who might enjoy them as much as myself. To make this easier on everyone, I created Restlesssoul Blurbs to keep track of my links and let anyone see what is peaking my interest at the moment. Think of it as me "trimming the fat" off the internet for you!